•A common digitising error is the formation of a "spike" along the length of the polyline. These are caused by a single vertex out of place forming an acute angle. An example is shown below. •Spikes are typically very short and extremely difficult to spot. Only when you zoom into your dataset will you see them. These are not real world situations, a river would never double back on itself at such an angle. They are data capture anomalies that do not alter the topology of the network but its cartographic representation and should be removed. Removing a spike will shorten your network (albeit a small amount), any previous analysis that involved distances should be re-run. •This tool uses the law of cosines to find angles that fall below a specified value. The default is 30° but you can change this. If you increase this value you will start to identify angles that may be legitimate, e.g. a right angle bend in a drainage ditch. •The output of this tool is a text file. This error log file is stored in the error log folder in the datasets workspace folder. 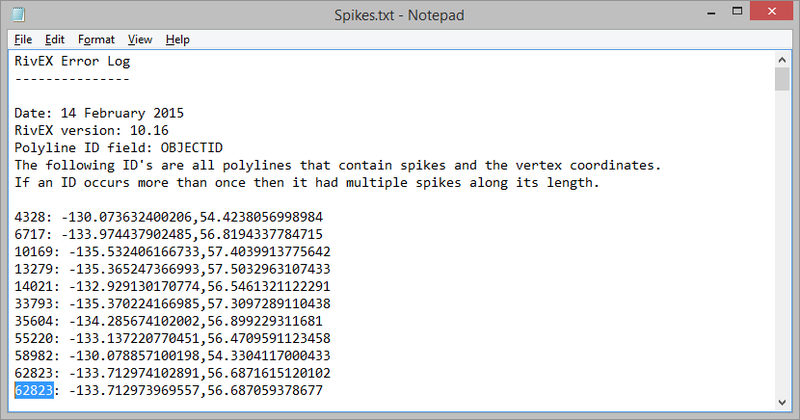 For each spike found, the polyline ID and vertex coordinates are written to the text file. You would then use the ID number to identify the polyline with a spike and then use the vertex coordinates to zoom in and make the edit required to remove it. You can either move the vertex in-line with the river segment or simply delete it. •This tool locates spikes within the length of a polyline, not spikes caused by two polylines joining at an acute angle.